Freighter: Built in 1906 by Swan, Hunter, and Wigham Richardson, Ltd., Newcastle England; Acquired by the Navy 22 February 1918; Commissioned 16 March 1918 at Paulliac, France; Decommissioned 20 February 1920 at Philadelphia, PA; Sold 2 August 1920. Fate unknown. Specifications: Displacement 2,300 t.; Length 235'; Beam 31' 8"; Draft 15' 9"; Speed 12 kts. ; Complement 51; Armament two 3". 156k At Pauillac, France, during the First World War. Note camouflage pattern painted on her smokestack, and possibly on her after deckhouses. The hulk of the old French coast defense ship Furieux (launched 1883) is in the center background. The original print, received from Naval Air Station, Pauillac, following World War I, had the following caption: "U.S.S. Bella carried half of the construction supplies sent from here to other stations." 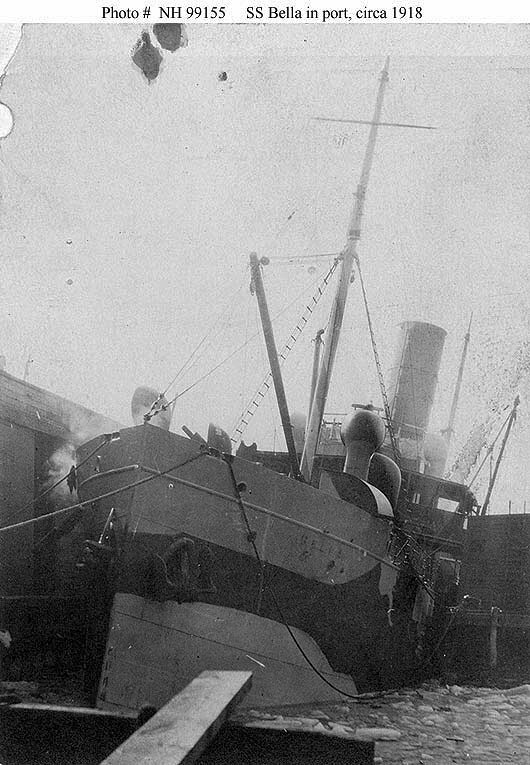 98k In an icy port, possibly when the Third Naval District inspected her on 15 January 1918. She appears to be wearing pattern camouflage. Bella is the diminutive of Arabella or Isabella. Bella (No. 2211), a cargo vessel, was built in 1906 by Swan, Hunter, and Wigham Richardson, Ltd., Newcastle England; purchased by the Navy 22 February 1918; and commissioned at the Naval Air Station, Paulliac, France 16 March 1918, Lieutenant (junior grade) J. H. Crozier, USCG, in command. 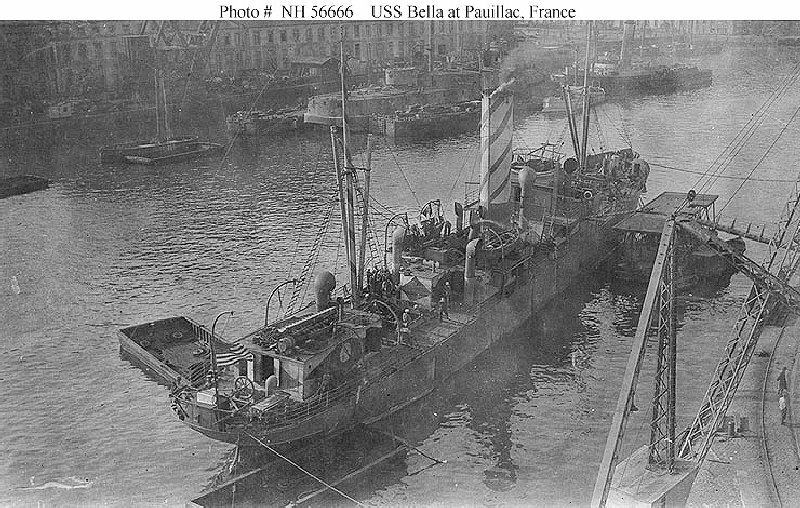 Bella carried aviation supplies and equipment between European ports until transferred to the Army Transport Service at Bordeaux, France 27 February 1919. The Navy, however, continued to man and operate her until she returned to Philadelphia 29 November 1919. Decommissioned there 20 February 1920, Bella was sold 2 August 1920.